Being charged with a criminal offense such as possession of marijuana, or a motor vehicle violation such as driving under the influence (DUI) in Mount Laurel, NJ, can expose you to severe penalties both in the long and short-term. If you have been arrested for a criminal or traffic offense in the Township of Mount Laurel, it incredibly important to consult with an experienced criminal defense attorney about your specific charges and the defenses that may be available to successfully resolve your case. At our criminal defense law firm, our skilled criminal defense lawyers use experience on both sides of the criminal justice system and unwavering dedication to deliver superior results to clients facing charges in Mount Laurel and throughout Southern New Jersey. Partner William C. Fay, is a former Deputy Attorney General who prosecuted cases on behalf of the AG’s office. He now uses this to reach excellence in the realm of criminal defense, so it is worth finding out how he and our team can help you. For a free consultation with an experienced Mount Laurel criminal defense attorney, call 609-832-3202 or send us an email today. You can read more of our client reviews by visiting Mr. Fay’s profile on Avvo.com. Also, please contact us anytime at 609-832-3202 to speak with a member of our legal team and receive your free consultation. Mount Laurel is a township in Burlington County, New Jersey, and a suburb of nearby Philadelphia. The township is very large, with over 41,000 residents housed within its nearly 22 square miles. There are many unincorporated communities and places with Mount Laurel township, including Ramblewood, Petersburg, Pine Grove, Birchfield, Bougher, Fellowship, Hartford, Heulings Hill, Masonville, Rancocas Woods, Centerton, Colemantown, and Coxs Corner. Running through these places are over 170 miles of roadways, some of which are well-known and heavily traveled. For instance, the New Jersey Turnpike passes through Mount Laurel Township, connecting Cherry Hill Township on one side to Westampton Township on the other. Additionally, Interstate 295, Route 38, Route 73 and County Route 537 all traverse Mount Laurel. Considering the number of people who live and travel through the township on a regular basis, a significant police presence is to be expected. In fact, there were 1,345 criminal charges, 130 DWIs, and 9,099 traffic violations issued by police in Mount Laurel Township between July and February, according to the latest reported court statistics. The Mount Laurel Township Municipal Court is responsible for handling criminal charges for disorderly persons offenses and petty disorderly persons offenses, as well traffic tickets and DWI charges issued within township limits. More serious charges for indictable crimes are sent to the Burlington County Superior Court in Mount Holly, NJ. The Mount Laurel Municipal Court is located at 100 Mt Laurel Rd in Mt Laurel, NJ 08054. The court is open from Monday through Friday between 8:00 AM and 4:00 PM and can be reached at 856-234-2003. Court sessions are held the second, third and fourth Tuesdays of each month and the first, third and fourth Wednesday of each month at 8:30 AM. The Honorable Peter C. Lange, Jr., is the presiding judge, George Morris, Esq. is the prosecutor, Valerie Brothers is the court administrator, and Rhonda Clayton and Judith Metzger are the deputy court administrators. For additional information, visit the Mount Laurel Municipal Court website. For more information about Mount Laurel, NJ, visit the Mt. Laurel Township website. The Mount Laurel Police Department Headquarters is located at 100 Mt Laurel Rd, Mt Laurel, NJ 08054. The police administrative offices are open from 8 am to 4 pm from Monday through Friday. If you need to reach the main number, it is 856-234-1414. Police records are open Monday through Friday from 8:00 am to 3:30 pm and can be reached at 856-722-7567 or via email at records@mountlaurelpd.org. For additional information about the Mount Laurel Police Department, access their website. 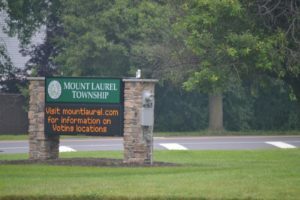 To read news and recent happenings in and around Mount Laurel Township, check out the Mt. Laurel Sun. If you or a loved one is facing criminal or DWI charges in Mount Laurel Township, New Jersey, we urge you to contact our criminal defense law firm to speak with an experienced criminal defense lawyer who can help. The consequences of a negative outcome in Mount Laurel Municipal Court can be shocking and permanently damaging to your life. Fortunately, our attorneys aggressively fight charges for simple assault, driving while suspended, possession of CDS, disorderly conduct, harassment, and many others in Mount Laurel on a regular basis. Contact us today at 609-832-3202 for answers about your specific case. We always provide consultations at no cost.